Some of the world’s best talent evaluators told Tom Pederson there was a chance he might be a decent college hockey player. The NHL? Forget about it kid. “Every scout I talked to, and I knew a bunch of them, said, ‘You are just too small, you are not going to make it,’ ” said Pederson, who stood 5-foot-8½ and weighed 165 pounds as a Bloomington Jefferson senior. “I said, ‘You are wrong.’ I wasn’t disrespectful to them, but I told them they were wrong. Hockey to Pederson was like a fresh kill to a lion. No one was going to take it away from him. At least not without losing an arm. Pederson grew up just a few blocks from Bloomington Jefferson High School. More important in the neighborhood geography was the outdoor rink within easy walking distance. “Every night, when they turned the lights off at the rink, I knew he would be home in about 15 minutes,” said Skip Pederson, Tom’s father. 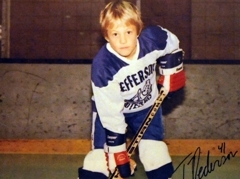 Tom Pederson started his youth career as a forward who scored 80 goals one season at the Squirt level. As a Bantam, he was moved back to defense. The idea of the position switch initially was shocking to Pederson. Pederson played heavy minutes for Jefferson starting when he was a sophomore. 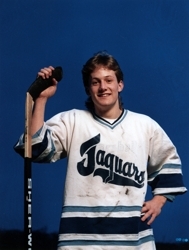 The Jaguars reached the state tournament that season, losing to goaltender Robb Stauber and Duluth Denfeld 4-2 in the quarterfinals and falling to South St. Paul by the same score in the consolation round. Pederson had a goal and an assist in the two games. 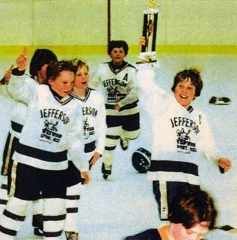 In 1986 Bloomington Jefferson lost 8-0 to intracity rival Kennedy in the Section 5 final. Kennedy went on to win the state championship. “You get to get out of school, you get on a bus, you stay in a hotel, you have all these articles in the paper,” Pederson said about playing in the state tournament. 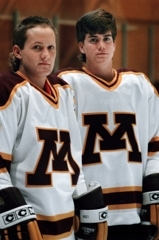 “You are going to play in front of 17,000 people out there, and you have the clear boards in the (St. Paul) Civic Center. Pederson had one more shot at returning to the state tournament as a senior in 1988. The Jaguars matched up against defending champion Kennedy once again in the section final, and this time Jefferson prevailed 3-1. Jefferson beat Grand Rapids 5-4 in overtime (Pederson assisted on Chris Tucker’s winning goal) in the quarterfinals, setting up a semifinal showdown with Hill-Murray. “(Pederson) was the best I ever played with,” said Tony Bianchi, a Jaguars junior in 1988 who went on to join Pederson at the University of Minnesota. “The guy was 5-9, but he played like he was 6-2. He shot the puck like he was 6-5. There was no such thing as half-speed for Pederson, who approached every game as if it was a cage match. Pederson’s intensity pushed well beyond normal high school levels. Some players simply couldn’t relate. “I look back on it now, I probably could have been a little better about that,” Pederson said. 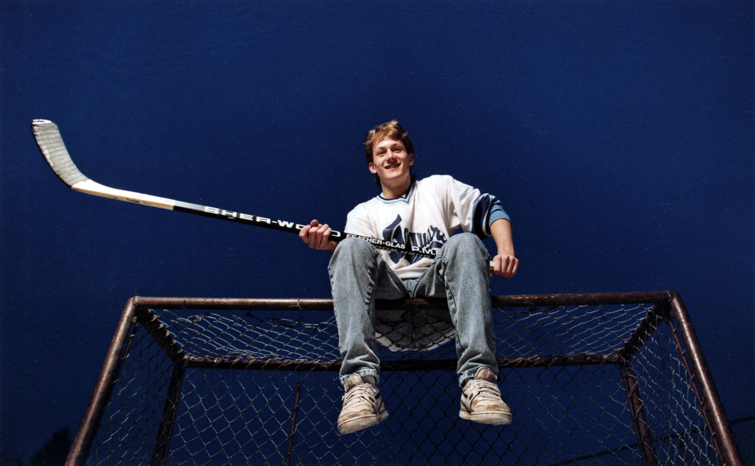 “I thought everybody thought about hockey the same way I did, that this was life or death. What I found out later, when I matured a little bit, was that these guys loved hockey, but it wasn’t an end-all for them. 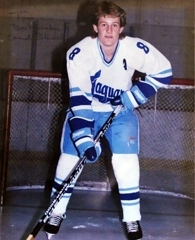 Pederson and the Jaguars lost 6-3 to Hill-Murray in the 1988 state tournament semifinals. He finished his high school career the following day with a 5-4 victory over Warroad in the third-place game. As a senior, Pederson scored 18 goals and added 29 assists for 47 points. 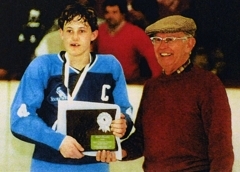 He was named the Star Tribune’s Metro Player of the Year and was a finalist for the Mr. Hockey Award won by Warroad’s Larry Olimb. 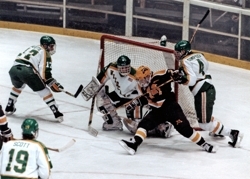 Pederson played three seasons at Minnesota, scoring 24, 38 and 32 points as a freshman, sophomore and junior. He played the first of his five NHL seasons in 1993-94 with the San Jose Sharks. Pederson, who played in 240 regular-season NHL games, retired from professional hockey in 2000. He lives in Los Gatos, Calif., a San Jose suburb, and is the owner and president of GreenBiscuit.com, a company that manufactures and sells an off-ice training puck.